Hi, my name is Craig Swenson. 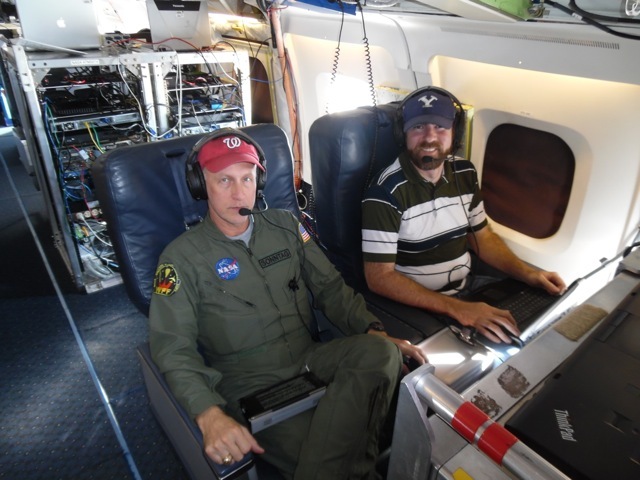 I’m one of the newest members of the NASA Operation IceBridge operation, having joined the Airborne Topographical Mapper (ATM) team days before being deployed to Punta Arenas, Chile to join the rest of the IceBridge team. 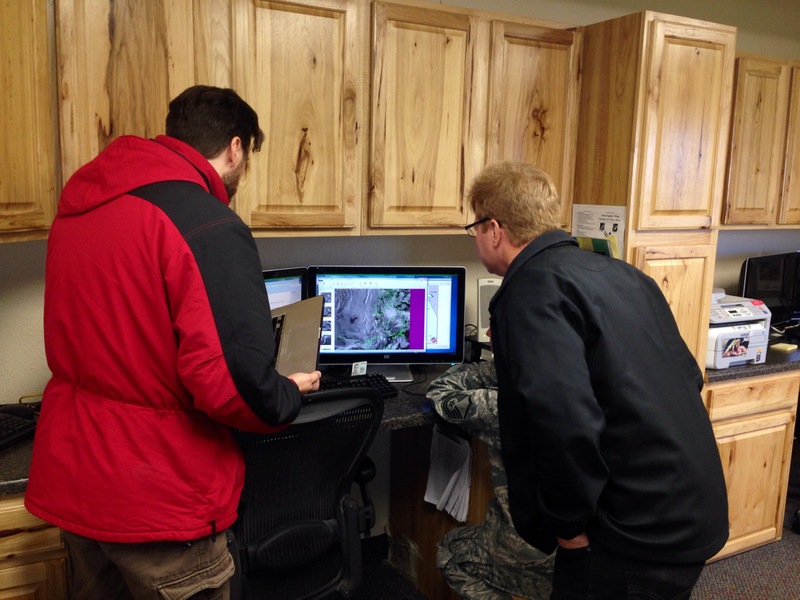 I have been actively involved with other NASA projects for several years, but am new to the world of cryospheric science and lidar instruments. For the past six years I was a member of the NASA Swift Science Operations Team and Ultraviolet/Optical Telescope Team while earning my Ph.D. in Astronomy and Astrophysics at the Pennsylvania State University. Working with a NASA satellite program was an exciting adventure, with each day bringing new discoveries to investigate and new problems to solve. My area of expertise involved searching for and studying flares (sudden increases in the observed brightness) found in the X-ray, ultraviolet and optical signals of a class of astrophysical objects known as gamma ray bursts. As a part of the IceBridge team I will be using the skills I developed while looking to the heavens to help determine the thickness of the ice below me. 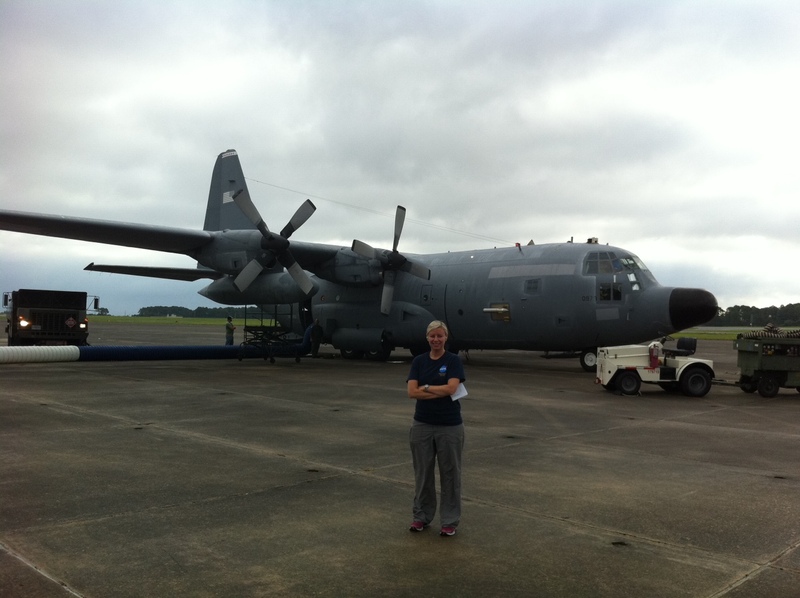 Working on an airborne observatory can be very different from working on a satellite mission. For instance, I did not need to bring my passport with me to work every day (just in case we land in a different country), and if an instrument malfunctions while in flight, we have the chance to get replacement parts and fix it. But in many ways it is very much the same, with new and challenging problems that need to be addressed every day, constantly looking for ways to improve our methods and obtain the most accurate measurements possible. It is an exciting way to live and work. 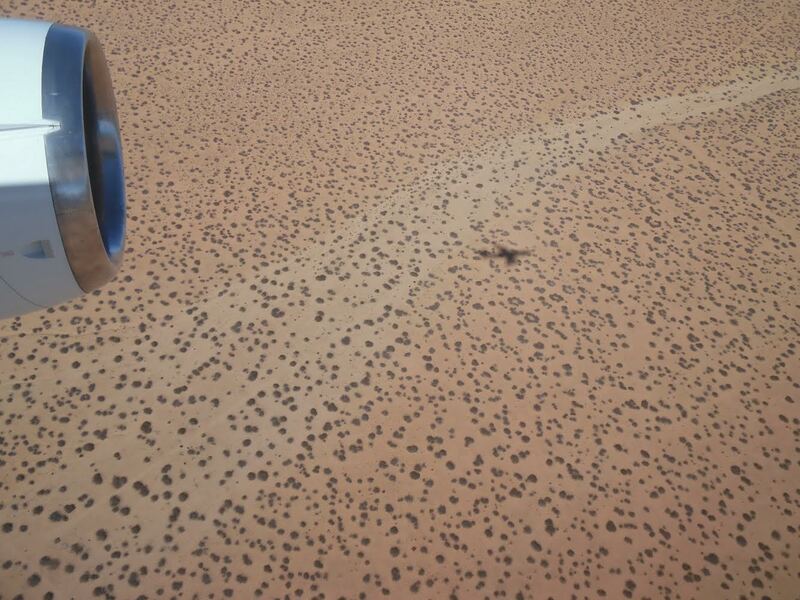 Looking out the window of the NASA DC-8 aircraft, I have witnessed sights that were previously only available to me through nature specials on television. The vastness of the Antarctic Peninsula is something that I had not fully appreciated until now. 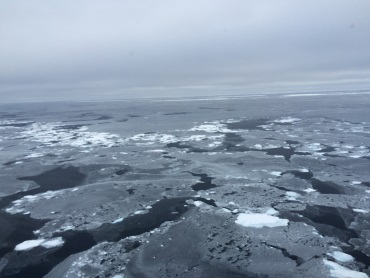 There is a certain beauty to be found in the stark emptiness I see out of my window each day, and it is amazing to hear from my co-workers how much the ice has changed and receded in the few years they have been collecting data here. I feel privileged to have the opportunity to work on such an important project. 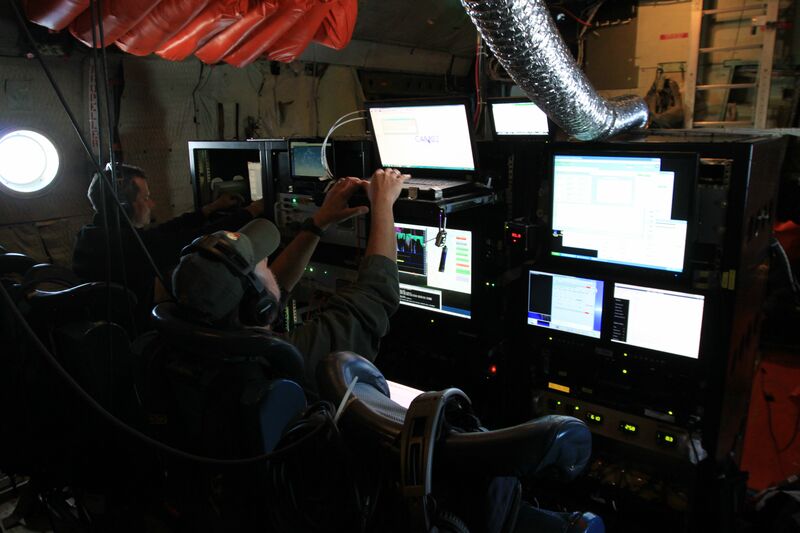 Operation IceBridge is instrumental in collecting data and providing answers that are pertinent to our everyday lives and to our future. Understanding the continually changing nature of our planet, and what influence we as humans are playing in the change, is something that affects every man, woman and child on earth and it brings me a sense of accomplishment and wonder to be part of a NASA mission that is addressing such pressing issues. At first, the geography of Antarctica might seem a little confusing. From space, much of Antarctica looks featureless and white, meaning there are few features to guide you. 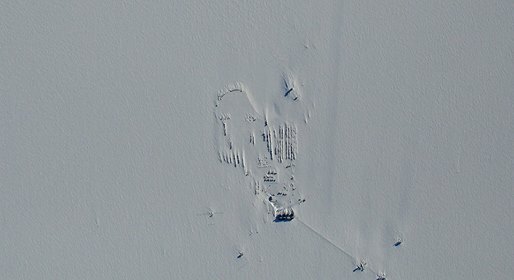 It’s one thing to know that Pine Island Glacier is in West Antarctica, but for some it might be unclear which part of the frozen continent is which. In the most general terms, Antarctica can be divided into three major areas: West Antarctica, East Antarctica and the Antarctic Peninsula. 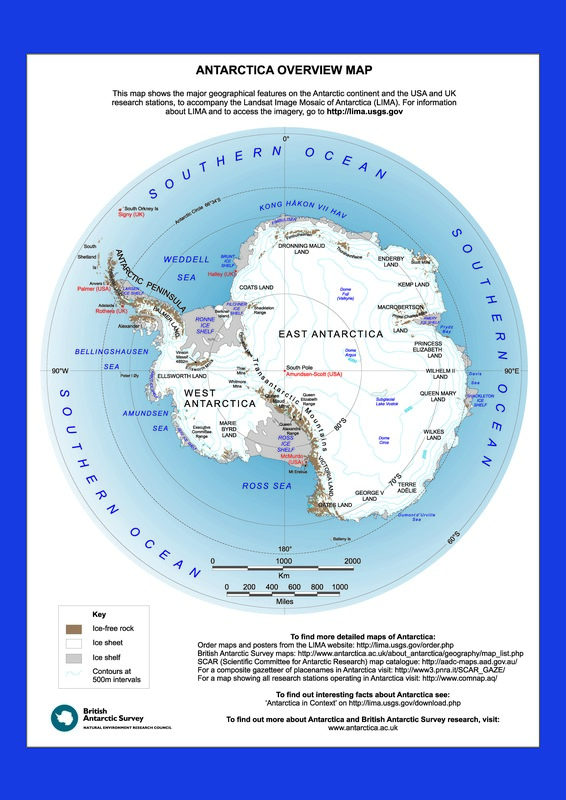 An overview map of Antarctica produced by the British Antarctic Survey to accompany the Landsat Image Mosaic of Antarctica, or LIMA. The Antarctic Peninsula is probably Antarctica’s most prominent geographical feature and is home to scientific stations operated by the United States, the United Kingdom, France, Australia and other nations. This curved extension of the continent extends nearly 250 miles north of the Antarctic Circle and points toward the southern tip of South America. The Antarctic Peninsula has a number of glaciers and large floating ice shelves that are changing rapidly because this part of Antarctica is warming faster than the rest of the continent. Running along the length of the peninsula, and extending across the continent is a mountain chain known as the Transantarctic Mountains. In addition to supplying spectacular views, the Transantarctics serve as a sort of dividing line across the continent, separating East and West Antarctica. 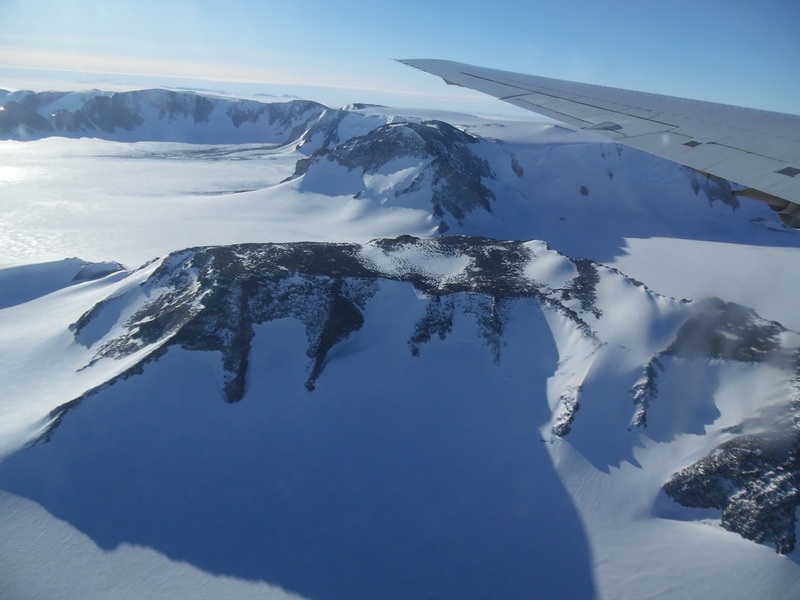 A view of the Transantarctic Mountains during IceBridge’s 2013 Antarctic campaign. Although the Antarctic Ice Sheet is a continuous mass of ice, but it is sometimes helpful to think of it as two separate masses known as the West Antarctic and East Antarctic ice sheets, which are separated by the Transantarctics. Ice on the west side of this line flows west, while the opposite happens east of the divide. East Antarctica is considerably larger than West Antarctica. The ice sheet covering East Antarctica is thick – nearly three miles (five kilometers) thick in some regions – and its surface is high and home to some of the coldest and driest condition on Earth. The East Antarctic Ice Sheet is also considered more stable than the West Antarctic. One reason for this is the shape and elevation of bedrock beneath the ice. 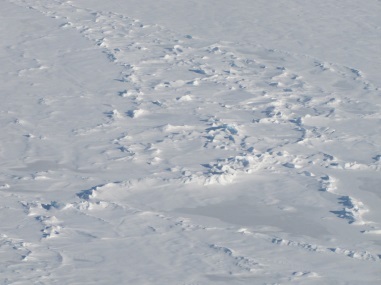 Heavy masses of ice push down on bedrock, depressing areas in the central part of the ice sheet below mean sea level. If those low-lying areas happen to be near the edge of the ice sheet, which is the case in large parts of West Antarctica, then ocean water can make its way under the ice, speeding up glacier flow. This is one of the reasons that while both portions of the ice sheet are losing mass, West Antarctica is moving much faster. Recent studies of West Antarctica found that many of the large, fast-moving glaciers there are in an irreversible decline. And while Antarctic land ice is shrinking, sea ice around the continent has been on the rise in recent years. Antarctica is surrounded on all sides by the Southern Ocean. 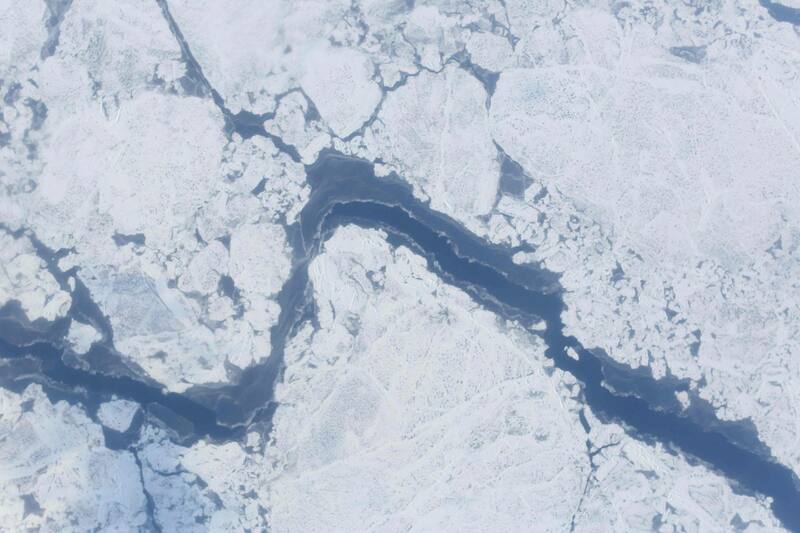 During the winter, ocean water freezes, forming a layer of sea ice of roughly the same area as the Antarctic continent. The ocean around Antarctica is divided into several seas. Starting to the right of the Antarctic Peninsula on the map above is the Weddell Sea, which extends to Cape Norvegia, a small point of land jutting off of East Antarctica. Moving clockwise we go around the East Antarctic coast all the way to the Ross Sea, south of New Zealand. Next comes the Amundsen Sea, which large West Antarctic glaciers like Pine Island and Thwaites drain into. And continuing on, we complete our trip around Antarctica, coming to the Bellingshausen Sea to the left of the Antarctic Peninsula. 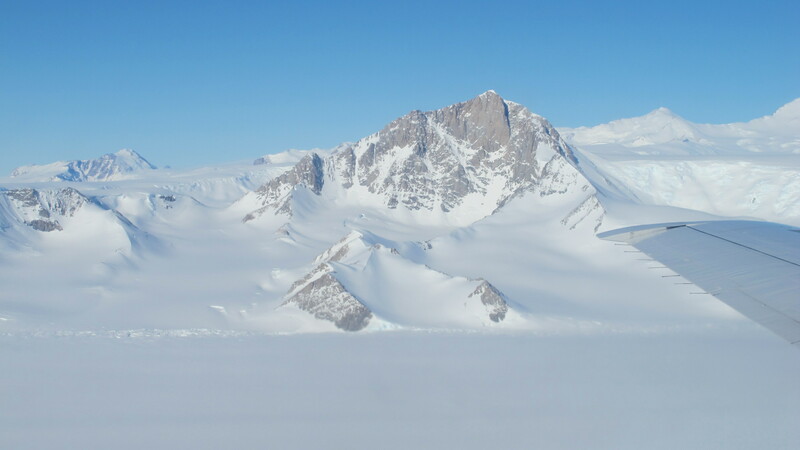 Antarctica is one of the most inaccessible places on Earth. Yet in spite of this, it is highly vulnerable to human impacts. This vulnerability along with the pristine nature of much of Antarctica is what has motivated a number of protective regulations, many of which IceBridge personnel have to keep in mind every day. The use of Antarctica is governed by an international agreement known as the Antarctic Treaty, which was signed by 13 nations in 1961. The Antarctic Treaty sets the continent and surrounding ocean aside for peaceful purposes like scientific research. Over the years more nations signed the treaty and more protocols regarding things like environmental protection were added to it. All over the continent are regions known as Antarctic Protected Areas. These fall into three categories, Antarctic Specially Protected Areas (ASPA), Antarctic Specially Managed Areas (ASMA), and Historic Sites or Monuments (HSM). When IceBridge plans its Antarctic flights these environmental protections and restrictions around known wildlife habitats come into play. 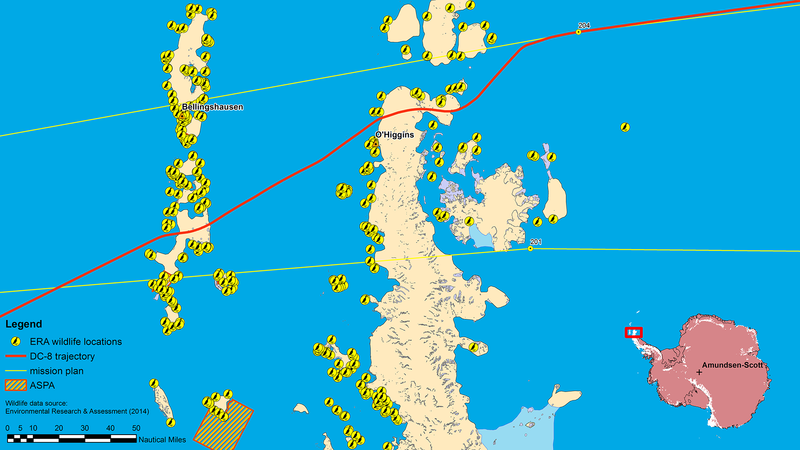 The areas surrounding McMurdo Station, where IceBridge was based last year, are full of protected areas and wildlife sites. On some occasions as soon as the NASA P-3 took off the team had to maneuver their way around restricted areas. On the DC-8 the time between takeoff and encountering a protected area is longer simply because of the distance between Punta Arenas and Antarctica. But there were two flights that took the DC-8 over a large managed area at the South Pole. 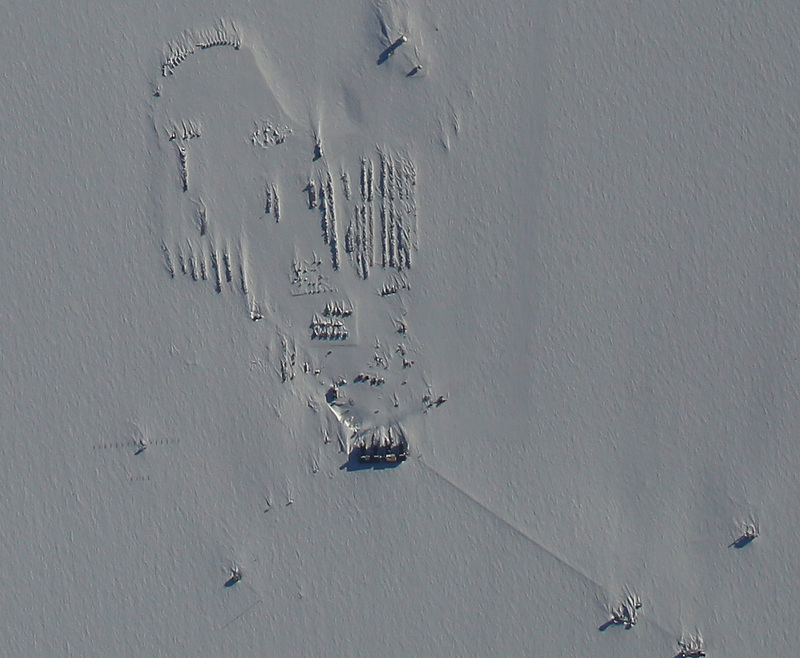 South Pole Station is the site of a large ASMA that covers just over 26,000 square kilometers and places limits on ground and air travel and the use of certain electronics. One particular portion is known as the Clean Air Sector, a wedge-shaped region that extends 150 kilometers out and 2000 meters above the surface. To comply with the ASMA rules at the South Pole, the DC-8 had to pass over at high altitude and had to shut down laser and radar instruments to avoid causing interference with scientific gear on the ground. While large ASMAs like that at the South Pole are a factor on a few flights, IceBridge has to keep a watchful eye out for wildlife locations on each flight in Antarctica. Penguins, seals and other animals in Antarctica could be disturbed by overflying aircraft, therefore planes have to stay a minimum distance away and above known wildlife locations, though IceBridge keeps an extra margin of safety by staying farther away. After a campaign is complete, officials with the National Science Foundation go over each survey’s flight path, checking the mission’s flight plans to make sure no wildlife protection rules were violated. 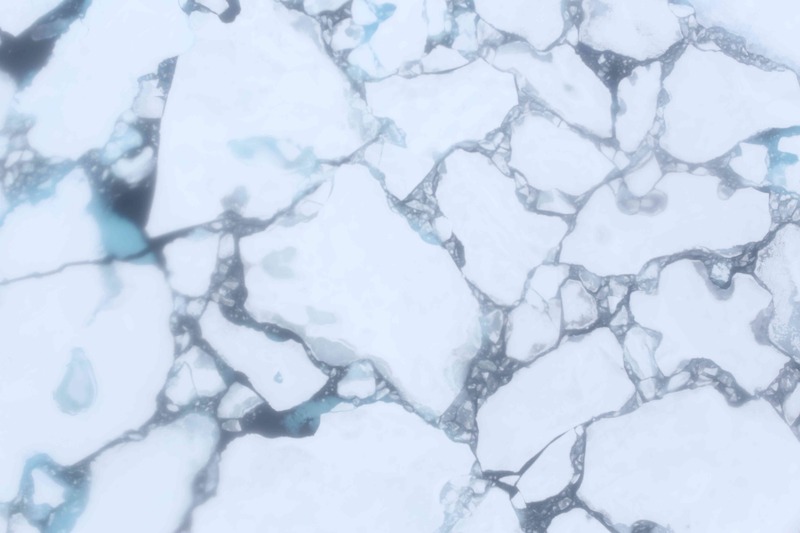 To ensure that the plane keeps a safe distance, IceBridge uses its sophisticated navigation equipment and a detailed map of places where animals live in and around Antarctica. Prior to each flight, mission planners discuss wildlife locations with pilots and navigators and remain in continual contact with the plane’s flight station about these sites. Studying Antarctica whether on the surface or in the air means that you’re going to have some sort of impact. The data gathered by researchers in Antarctica is valuable to improving our understanding of the world, so the best option we have is to minimize that impact. And with proper training and a good dose of care from teams working in Antarctica, scientists can learn about it while still preserving it. At the southern tip of Chile, the city of Punta Arenas is in a prime location for accessing Antarctica. This is one of the reasons IceBridge calls Punta Arenas home for several weeks during Antarctic field campaigns. But IceBridge isn’t the only scientific game in town. 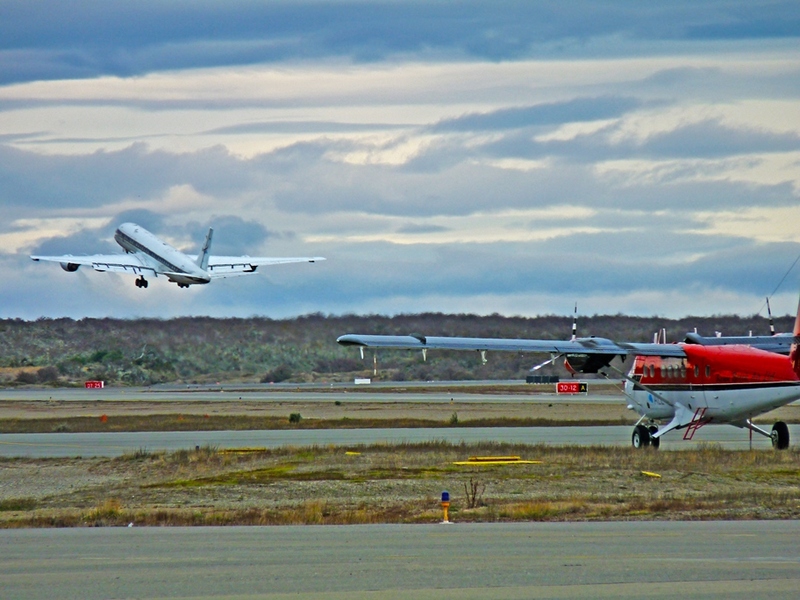 The U.S. Antarctic Program (USAP), British Antarctic Survey (BAS) and number of other organizations also rely on the Punta Arenas airport and the town’s ocean access. 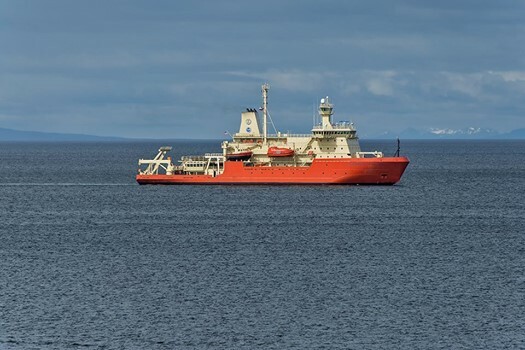 The USAP brings two of its ice-capable research vessels, the Palmer and the Gould, to Punta Arenas. 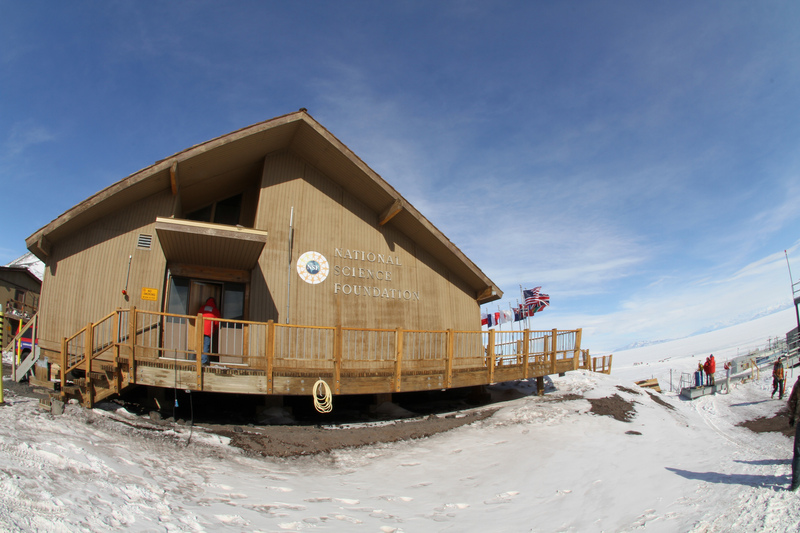 From there they carry out research cruises and transport people and cargo to and from Palmer Station, the National Science Foundation’s research base on the Antarctic Peninsula. 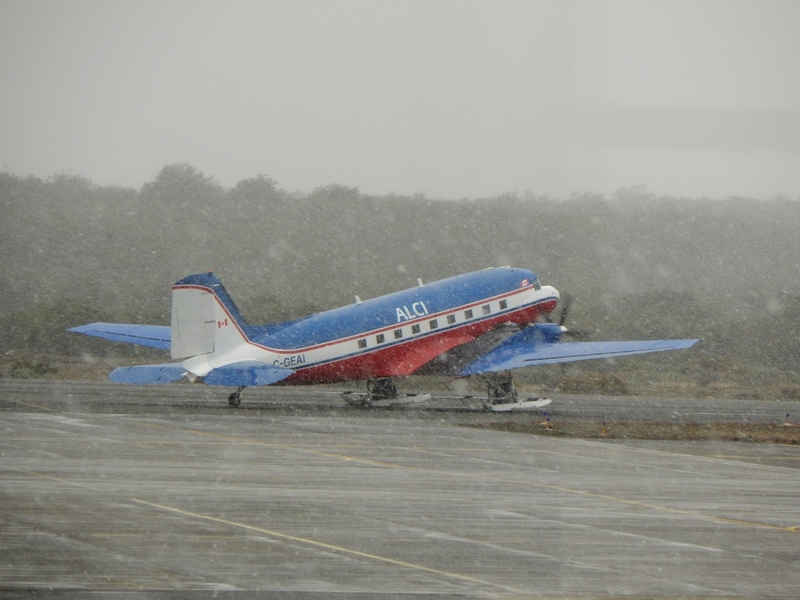 In addition, USAP will sometimes base aircraft at the Punta Arenas airport on their way to and from Antarctica. The United States isn’t the only nation with a strong presence in Patagonia. BAS research teams use Punta Arenas as a jumping off point for their research bases such as Rothera Station on the Antarctic Peninsula. 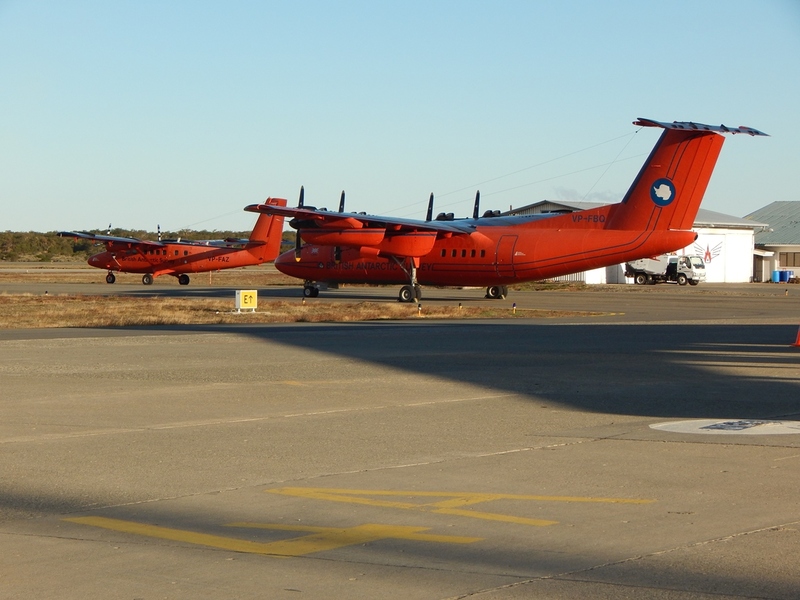 In the photo below we can see a BAS Dash-7 and Twin Otter aircraft on the ramp at the Punta Arenas airport. 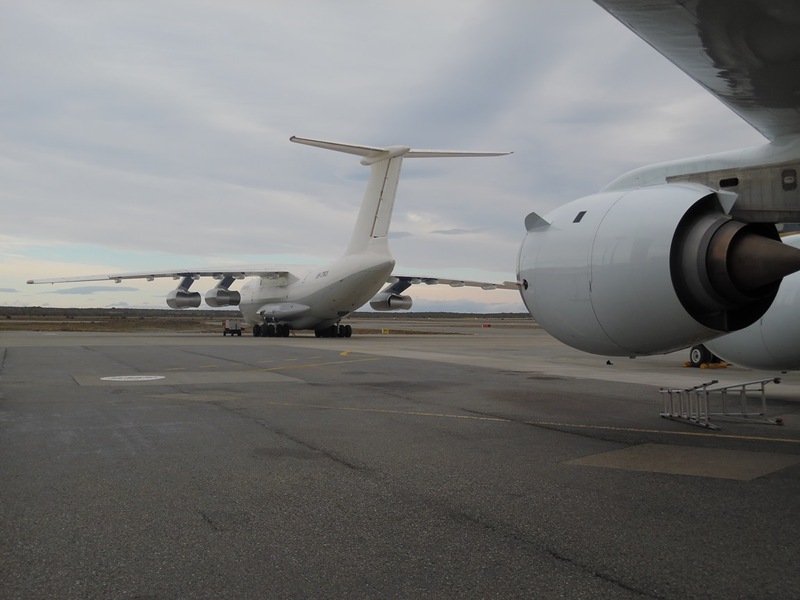 In addition to the various Antarctic research programs working here, a number of companies that transport people, equipment and supplies to Antarctica fly in and out of Punta Arenas during the research season. Below are an IL-76 cargo jet operated by Almaty Air and a ski-equipped DC-3T aircraft flown by Antarctic Logistics Centre International. With that in mind I am more appreciative of the power of nature and chance which helps to deflate any unnatural sense of superiority and self-importance. 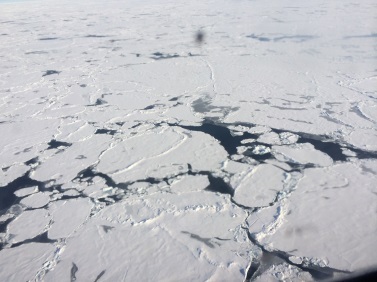 But it also brings to mind a paradox, our aircraft is little more than a mere speck to the size of the problem which we are studying, and yet this speck is tasked with carrying out a mission to provide meaningful information on the state of the Antarctic and the global impact of changes to the region. Consider the scale of the problem: the Antarctic ice sheet is more than 5 million square miles and the surrounding sea ice reached an extent of 7.8 million square miles this past September. As a rough estimate, the IceBridge dataset will cover some 20,000 square miles, while this is quite large, it is still a mere fraction of a percent of the total area of Antarctica and the surrounding seas. This large difference in scale underscores one very difficult nature of the problem and illustrates the main reason I personally feel quite small in the face of something so immense. Undoubtedly the Antarctic is seen as important to consider as a topic of interest beyond certain specialized branches of science. The Antarctic ice sheet has the potential to raise sea level by over 200 feet were it to melt in entirety, a number which carries significance to the large numbers of people living in coastal regions. Antarctic sea ice is an important regulator of the global temperature since it reflects a large portion of solar radiation back to space which helps to lower the mean global temperature. It also influences the deep ocean circulation allowing higher forms of life to thrive even at the greatest depths. Acknowledgment of powerful factors such as these has captured the attention of a broad swath of people and was aptly demonstrated this past year with the release of two major stories by the media concerning changes in the Antarctic. The front page of the New York Times rang out “Scientists Warn of Rising Oceans From Polar Melt”. This story, (which IceBridge data played a role) was in reference to recent findings that the West Antarctic Ice Sheet is now in an irreversible decline to take place over the course of the next thousand years or so. A second widely circulated story was on the observation that Antarctic sea ice had reached the highest extent ever observed in the satellite era this past September, a counter-intuitive phenomenon that superficially defies conventional expectations on what a warming climate should do to polar ice. Though it does have, in fact, a rational physical explanation, it is currently the subject of much scientific inquiry due to the complexity of factors involved. Thus, this brings to my mind a sense of uncertainty that overwhelmingly powerful forces of nature are in control – despite our great technological capability – and yet it is our technological capability which allows us to see this on a grand scale. But the lack of control brings to mind doubt, how can we be so clever to see large forces at work and yet also be powerless to change a potentially negative course of action? 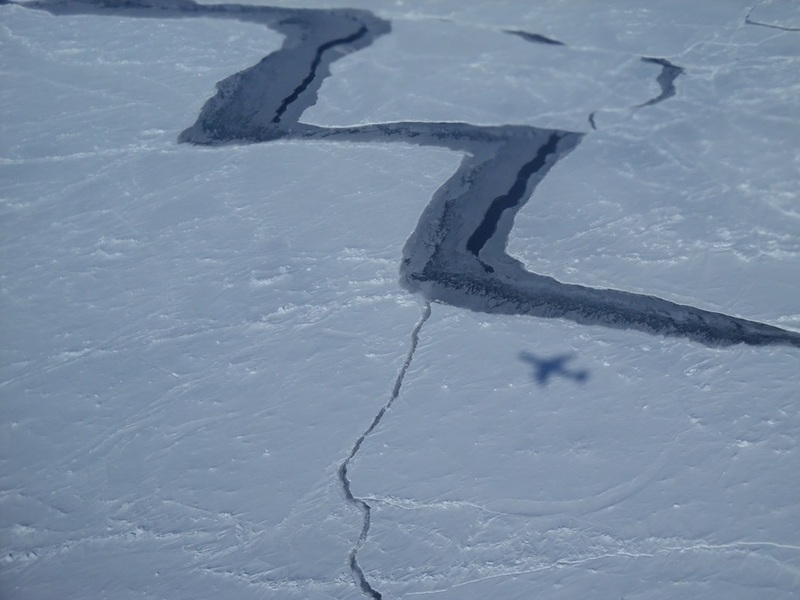 This sense of doubt and uncertainty casts a long shadow, a shadow which also has bearing on the IceBridge mission. In essence, it comes from recognition of the fact that science is not perfect, and claims to the absolute validity of anything should be taken with doubt. The existence of doubt is paramount to how the scientific method works, in that ideas are questioned and tested. In another sense, a lack of doubt and skepticism is also harmful, for as Voltaire says “Those who can make you believe absurdities can make you commit atrocities.” It is exactly this type of doubt that sows mistrust, skepticism and at worst nihilism – that everything is too doubtful and meaningless, that the scales are too large and our measurements too small and uncertain. Essentially, a new paradox arises in that doubt and skepticism are necessary yet are harmful at the same time if not properly balanced. The scientific process has a remedy for this in the use of numbers to bring order to chaotic processes which may seem otherwise too difficult to grasp. Numbers are a unique invention which allows us to unite the grand scale to the small scale at which we make actual observations. As an example, IceBridge took measurements of surface elevation over a circle centered at 88 degrees latitude. This is useful for both the CryoSat-2 and ICESat-2 satellites because their orbits take them across this region every revolution. On a broad scale, it is thought this is a useful target area because it is located on a part of the polar plateau which is not expected to change significantly in time. 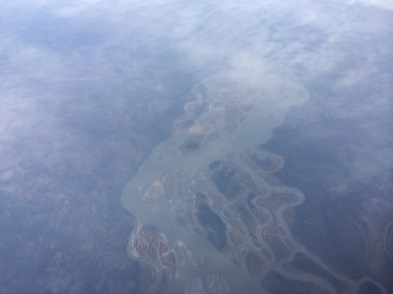 But looking out on the surface from the plane revealed a chaotic surface of ridges called sastrugi that are shaped by the howling winds blowing over the surface. Yet features such as these can be described in a simple numeric that distills the visual chaos into something more understandable. This then allows comparisons between different measurements at different spatial scales and times. That is, a point measurement may by itself may convey little information, but brought together in the form of a number (for ICESat-2 this is in the form of a mean difference or bias) it can be compared to a greater whole. However, numbers can be misleading if cherry-picked to support a particular position. The descent into hair-splitting sophistry and (at heart) overly-emotional polemics so prevalent in many public forums today is evidence of this at work. This leads me to my final question, can numbers alone convey the truth such that their meaning is appropriately acted upon? Or does the associated ability to manipulate numbers to promote a subjective “truth” negate this? Perhaps what is needed to reconcile this dilemma is integrity, which derives from the Latin root “integer” meaning whole or undivided, and is perhaps not incidentally also a specific type of special numbers in mathematics. That is, if one can provide numbers, and do so with integrity, one can then have conviction such that the truth emerges, can gain acceptance, and be acted upon in a meaningful way. Yet even here it is wise to beware that this is some panacea which will solve all these complex problems. In my opinion providing numbers is a step, at least the only way I personally can attempt to reconcile the large and small scales which have confronted me. As I prepare to head back home to begin working on data from past missions, I have hope that the seemingly small contributions of myself and the crew, engineers, and other scientists will provide some connection to be statistically significant at a much larger scale. Before each IceBridge campaign, the mission’s aircraft and instrument teams spend weeks getting the plane and all its scientific equipment ready for the research ahead. On Oct. 7 and 8, 2014, IceBridge put the finishing touches on those with two instrument check flights, designed to ensure that everything is in working order. On Oct. 7, the NASA DC-8 took off from the NASA Armstrong Flight Research Center facility in Palmdale, California, and headed out over the Pacific Ocean for a five-hour flight to test the various radar instruments aboard. The next day, the IceBridge team boarded the DC-8 for a second check flight, this time to test the laser altimeters, camera and gravity measuring instruments on board. 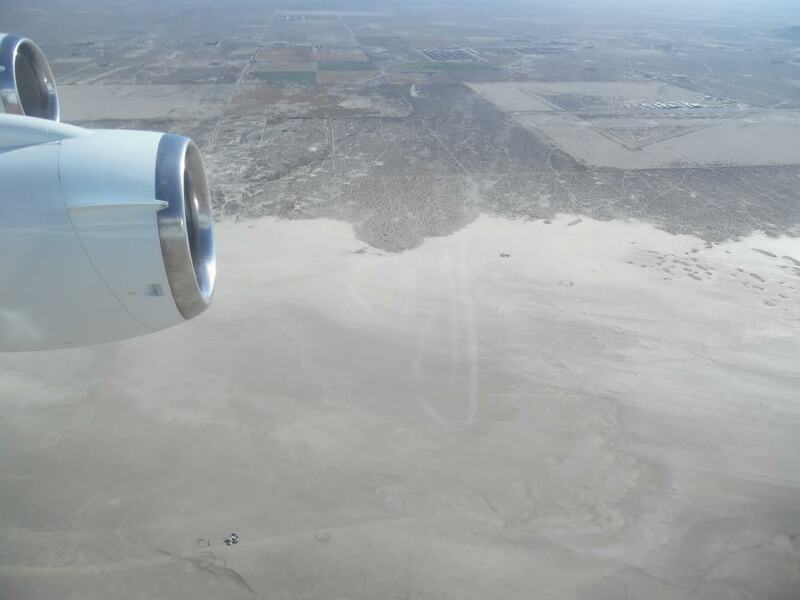 To carry this out, the DC-8 flew repeatedly over one of the ramps at the Armstrong facility and over El Mirage, a dry lake bed in the Mojave Desert. The flat and light-colored surface of El Mirage makes it a good place to test how the laser altimeter will work on ice and snow. The IceBridge team will leave California on Oct. 12 and travel to Punta Arenas, Chile, where the mission will fly surveys of Antarctic land and sea ice through late November. Today was a long flight day. It started off by trying to guess where the high clouds (i.e. cirrus) will move in. We had to choose between three options, and our choice turned out to be a good bet. 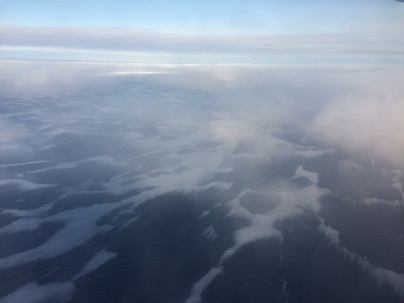 We flew to the edge of the sea ice to try to characterize both its exact mapping and see whether the clouds look different or have different characteristics, height and composition (i.e. water and ice) above the sea-ice versus open ocean. 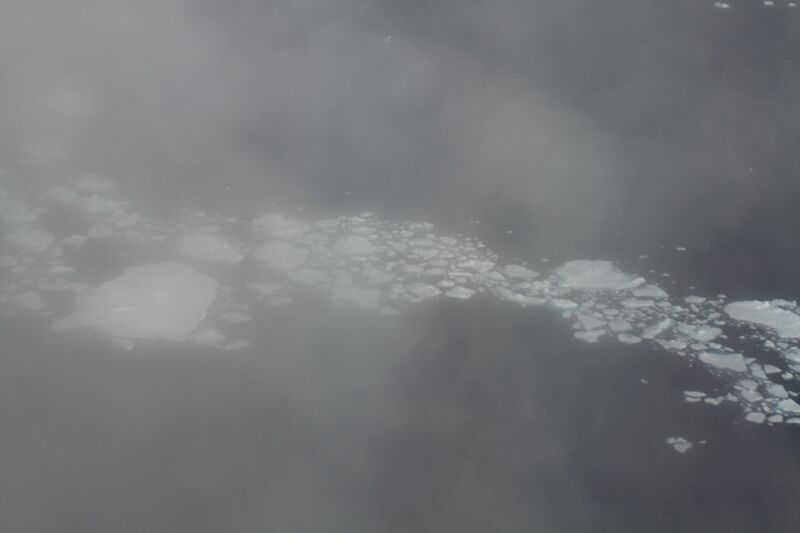 We had a mix of high clouds above ice but also clear regions, with black and white ice, as seen in the pictures. The sun was posing for us and we got to see some halo forming around the sun. 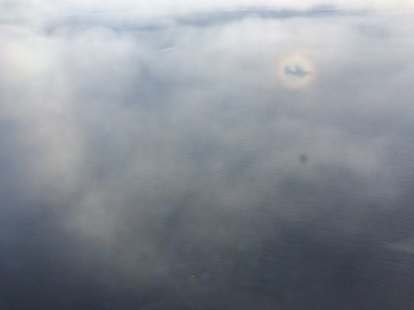 This means that we had ice clouds (cirrostratus) with particular ice shapes of smooth hexagonal crystals are reflecting and refracting the sun rays to form this circle of light surrounding the sun. Today was a challenging day. 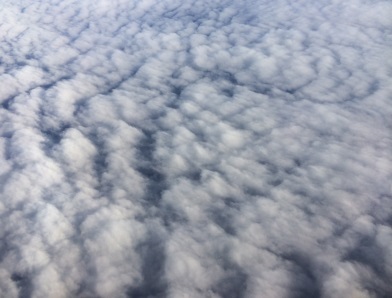 We were after clouds, and oh, they are “hard-to-get” into a specific posture. 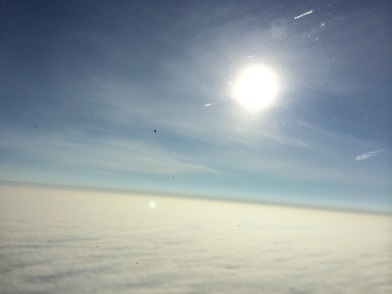 We flew high to check the area and had a gorgeous stratus deck below us. The word stratus in Latin means “spread out” and boy, they were spread out all right. At some point we saw an opportunity to dive below the clouds, and cruising over the broken sea-ice, we felt like we were in a Star Trek episode. Clouds are so diverse and changeable, so we want to sample them as often as possible to get a feel for their heights, thicknesses and what type of particles they include (water, ice or a mixture of both). This is important because their location in the atmosphere (how high or low they are) and their composition dictates the amount of radiation they absorb or scatter back into space and how they affect the surface below, either warming or cooling. This was a challenging and bumpy flight from all perspectives, but all in all it ended well. We had many more flights, some I flew myself, some were flown by my 4STAR team fellows. 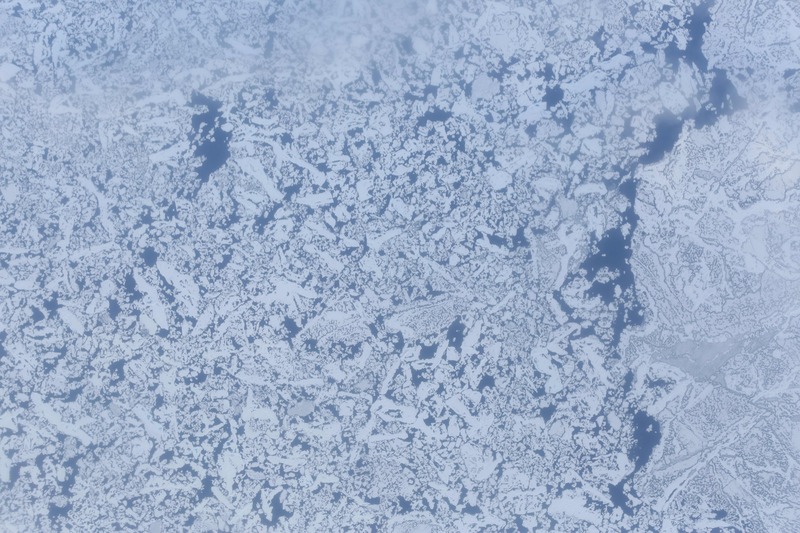 All flights were magnificent in that they covered pristine sea ice regions, where human access is difficult and low and high clouds over these regions (especially at this time of year) means even the satellites often cannot take measurements. We had some weather and technical hurdles some days, but we succeeded in most of our goals, which were to measure sea-ice formation and state, study sunlight and thermal energy over the sea-ice and open ocean, and characterize cloud spread and type in this complex and important region. 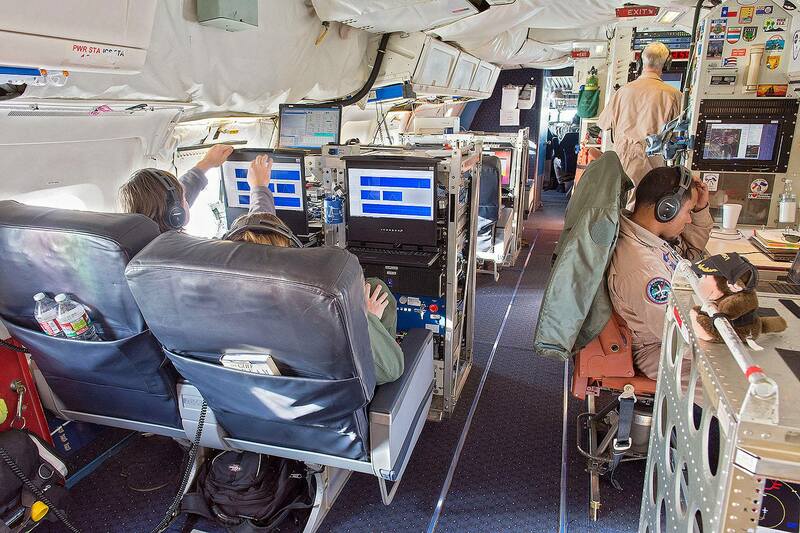 Our final science flight was on Oct. 2, and was dedicated to instrument calibration. It lasted for almost nine hours and ended after sunset, since some of the instruments (including our own SUN-photometer) needed to be calibrated by the sun, looking at the wide range of sunlight intensity during sunrise or sunset period. 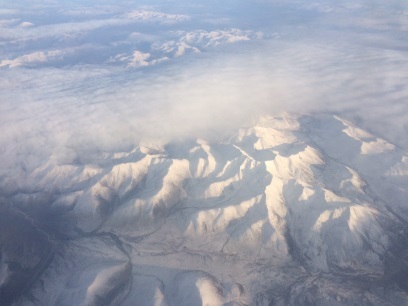 We flew over some dormant volcanos in the southern part of Alaska, over glaciers and Denali park. What a great finale to a great campaign! Looking forward for next year’s one already.